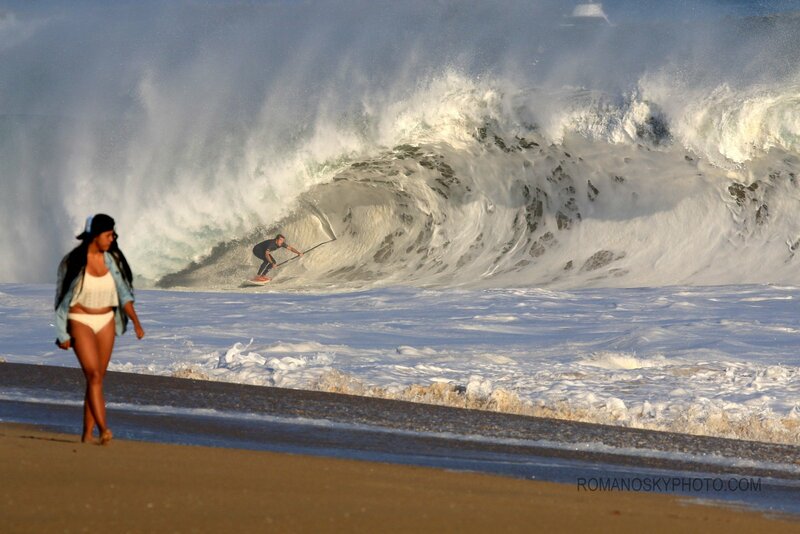 Ron Romanosky rode Wedge for decades as a knee boarder and bodysurfer and has long been known as a strong supporter of Wedge bodysurfing. He has photographed and documented Wedge in its entirety, its standout bodysurfers and its unique ongoing story for years, long before the www and social media discovered and exploited the place. 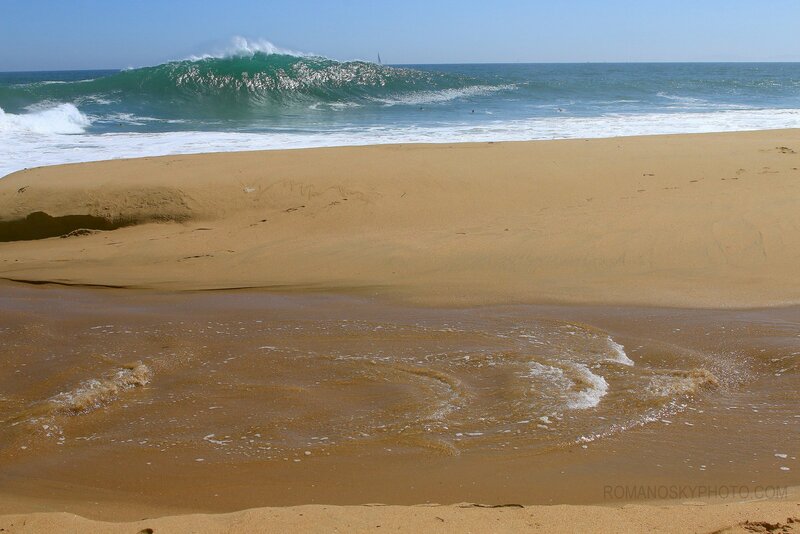 From its inception the Surfers Journal has published Ron’s photos of Wedge and of surfing in general. The Journal also published three Wedge-related pieces written by him, the last of which was Our Wedge, Our Way. His photos have appeared in print media around the world. He continues to shape kneeboards under the logo ROMANOSKY and has websites for kneeboards and photography: www.romanoskykneeboards.com and www.romanoskyphoto.com Note: A battle with late stage throat cancer necessitating weeks of chemo and radiation treatments in 2009 led to Ron’s decision to leave the wedge lineup. 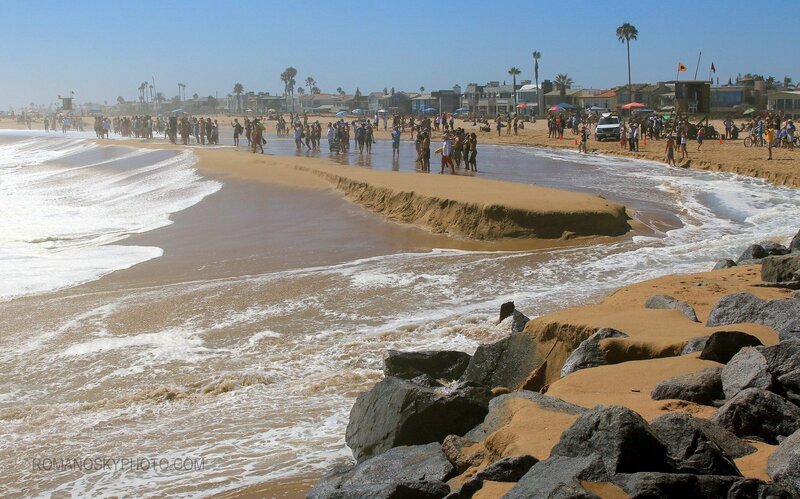 This is the Wedge California and I knew years before the internet and long before every attention-craving social media post would immediately be known to the world. The image, from a 35mm slide and one of a several shot sequence, was captured at mid-day in the summer of 1990 or 1991. No, the transparency was not scanned to facilitate photo-shop to remove anyone from the image or to add anything. 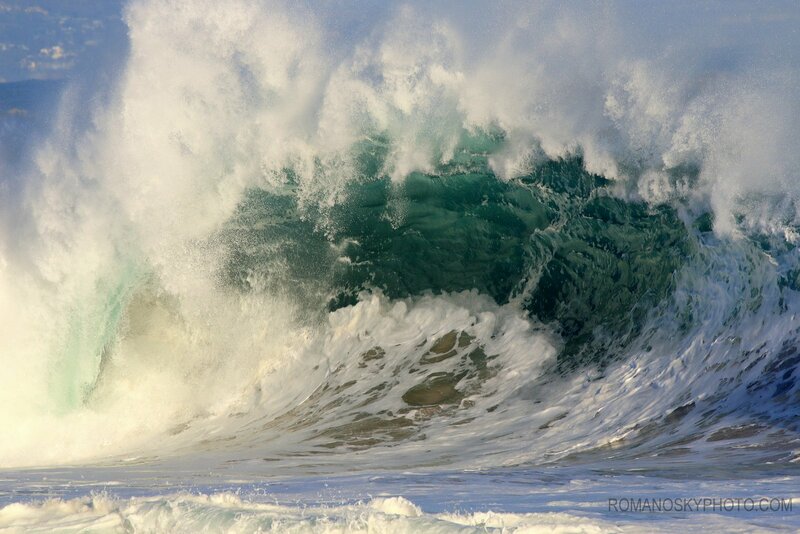 Minutes prior to this wave – one of a 3 or 4 wave set, several bodysurfing friends and I had been in the water. Scattered about on the beach was a small number of beach goers more interested in tanning. The word mellow adequately describes that day. The only camera there was mine. There were many days such as this one – of a pristine Wedge, etched into my memory banks… and, for both substantiation and history, archived in my film collections. First called ‘The Hook’ Wedge (it’s ‘The Wedge’ to the TV and news media and the great masses directed there) has hooked riders and fans for decades. 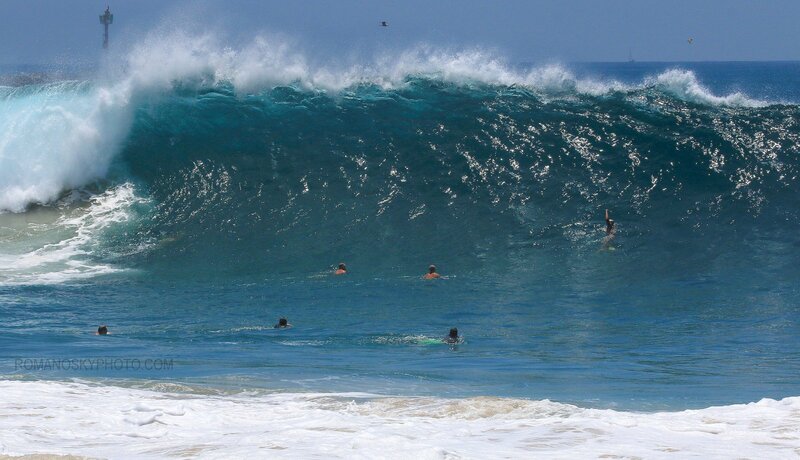 And since the advent of the internet (and consequently, due to it) this once bodysurfing-only spot during big south swells has become ground zero for riders of every persuasion and trend who would challenge it, test themselves and hope to “star”. Unfortunately, Wedge’s fame and notoriety have not escaped the usual commercial and promotional interests (specifically, skim and surfboard companies and many photographers) who covet the break for its earning potential. 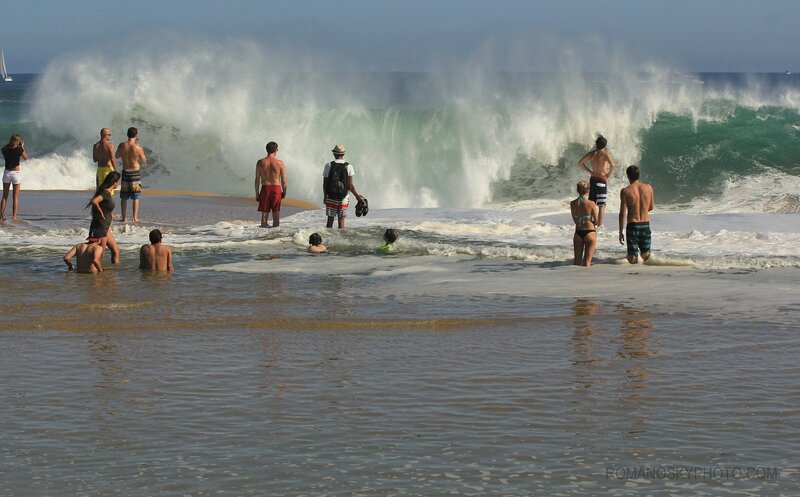 Wedge bodysurfing would likely become a memory if these interests had their way. 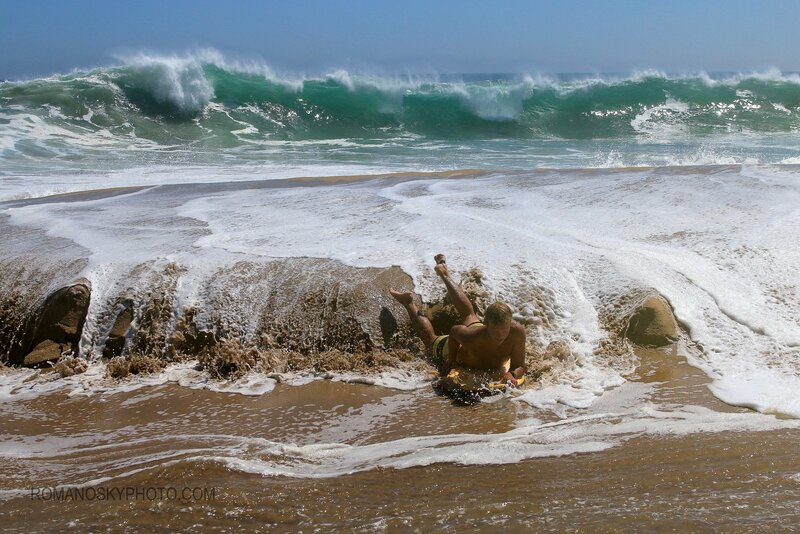 Fortunately the Newport Beach City Council has not yet allowed Wedge to become California board surfing’s first whorehouse… nor, it is hoped by bodysurfers and Balboa Peninsula homeowners alike, will it ever. This set peak is reserved for the bodysurfer who has positioned himself in the right spot, as small and specific as it always seems to be on the big ones, and who possesses the rare abilities to catch and grace it with skills which are the end result of years of dedication and experience. And let us not forget the parts played by aptitude, passion, stamina and talent in the makeup of an outstanding bodysurfer. 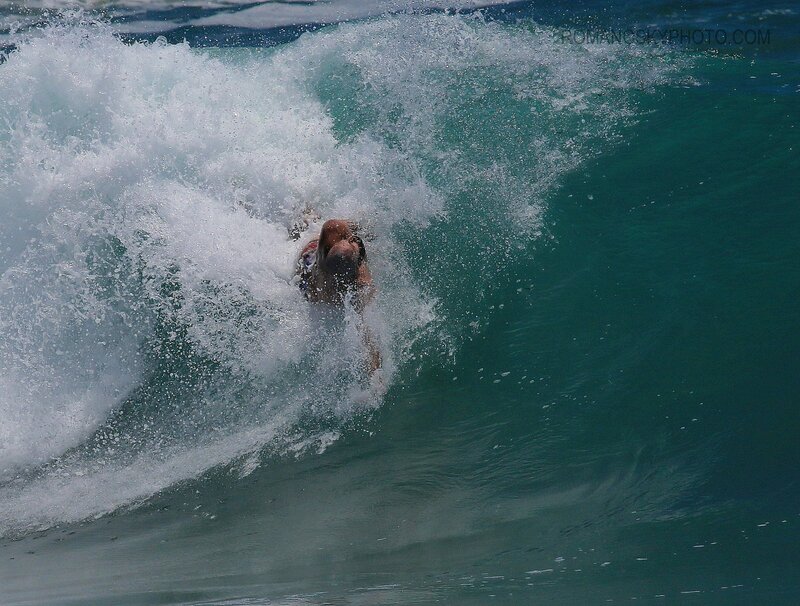 And the end result when such an individual glides across a good wave? Nothing other than the exhibition of an art form. Inviting shape here. With the majority of this swell’s set waves being quite the opposite it was disappointing that no one took it. 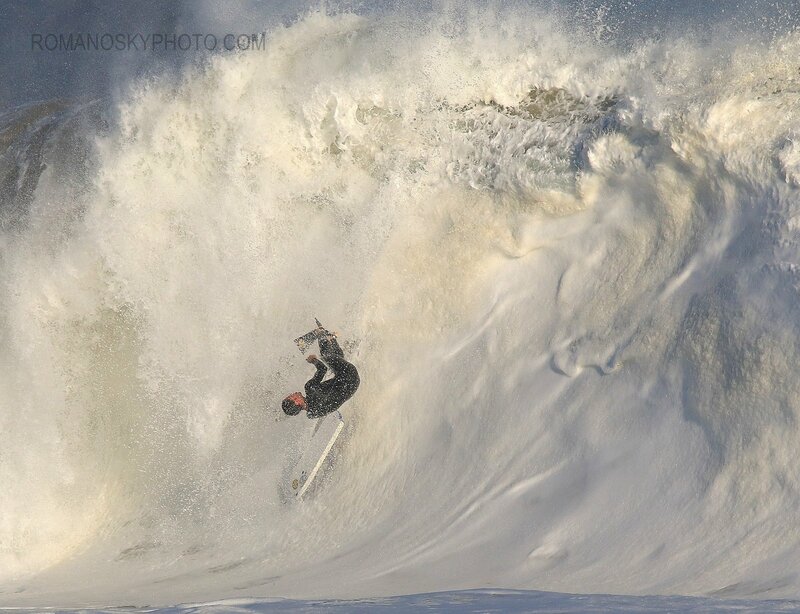 With big souths being as rare as rain in SoCal one could even imagine that one rider might have snaked another on this one. But as wrong as that offence is, it happens… and it was not uncommon 2-3 years ago. The water temperature on both days was as nice as the absence of wetsuits should indicate. Teddy Bandaruk on a good one. The water color is real, not enhanced. The swell, although not an all-timer, had an inordinate amount of push as the tide filled in on the 6th. The great amount of water constantly refilling the depression behind the berm resulted in the largest pond and “river” many long-time Wedge people have ever witnessed. The rapids had small standing waves that were even rideable on boogies. Everyone, save those who got drenched, lost belongings or got their cameras ruined, enjoyed this face of Wedge. Parker Varner “riding” the sand bar of sand bars. This shot gives a good idea of the swell’s push. The little kids were loving it – hard to imagine their experiences from this day not being etched into their memories for all time. Sean Starky where he likes being. Not a big wave, but a rare right. The lighting and white water dramatize the image some. Rider ? Long time bodysurfers Rick Piani and Craig Plitt standing next to a stretching Sean Starky. These three represent 60 or more years of Wedge experience. The un-rideable? No way. If there’s a camera on the beach or in the water there’s always some willing bloke for some rogueish Wedge thing, damn the consequences (unless they’re suffered, eh?). Thick… nasty… hollow… and rideable. Trick with one like this is catching it where it’s catchable. An added pleasure: not witnessing the clutter of water snappers usually populating and polluting the wave’s fore’water’. Catching the crowd in this shot was intentional. Thomas VanMelum in the middle of what was a smooth spinner. To really appreciate a good spinner it must be seen taking place or in a video. A still photo will not do one justice. The height of this wave breaking in the harbor entrance usually indicates an epic swell seen perhaps once every 3 or 4 years. 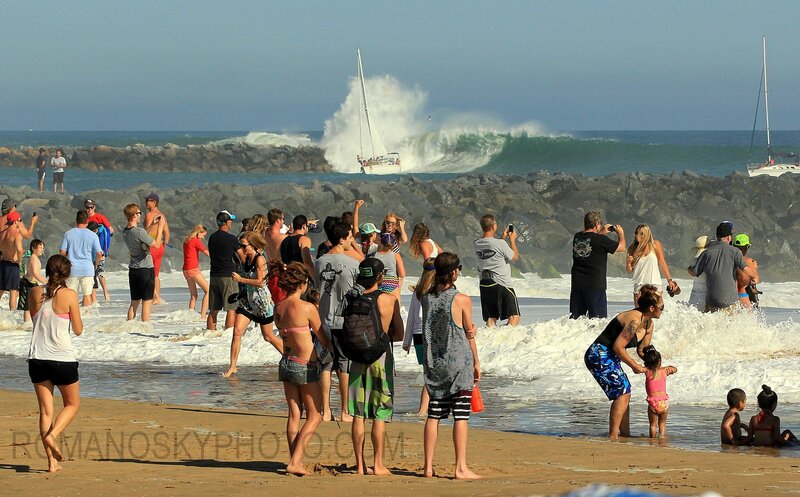 Accordingly the set waves at Wedge should have exceeded 30 feet in face height (the largest this swell may have been twenty). 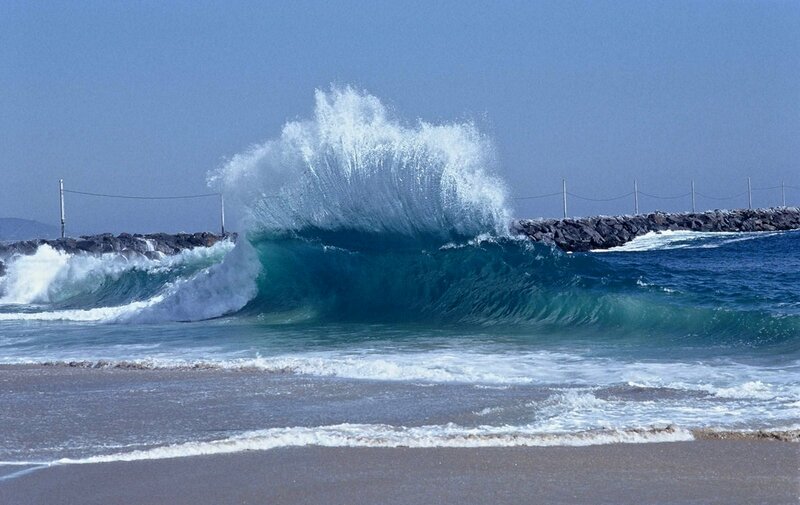 Note: Photographing such a wave from the Wedge jetty’s rocks, without the people, remains a quest. Yes – SUPers are becoming part of the on-going, ever-changing Wedge story. Thank the Heavens for the Blackball! No caption necessary, though paramedics are occasionally summoned after such beauties. Not an enviable position, eh? 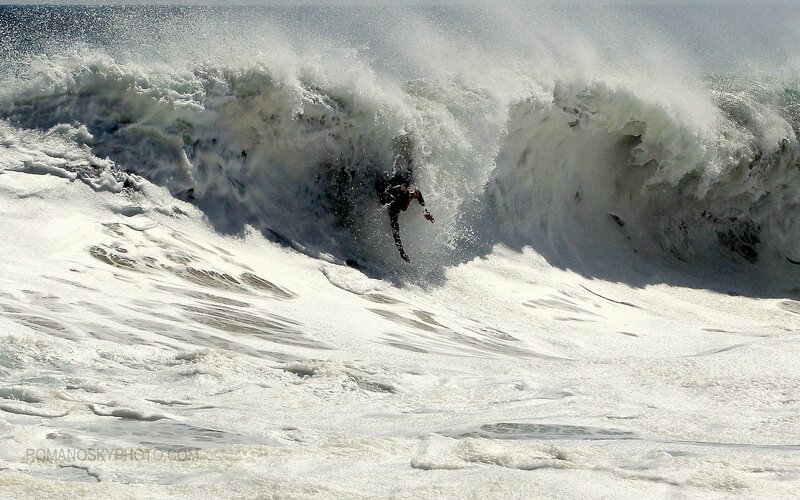 Bud Browne would have paid to have caught this wipeout. So Bud, this one’s for you. 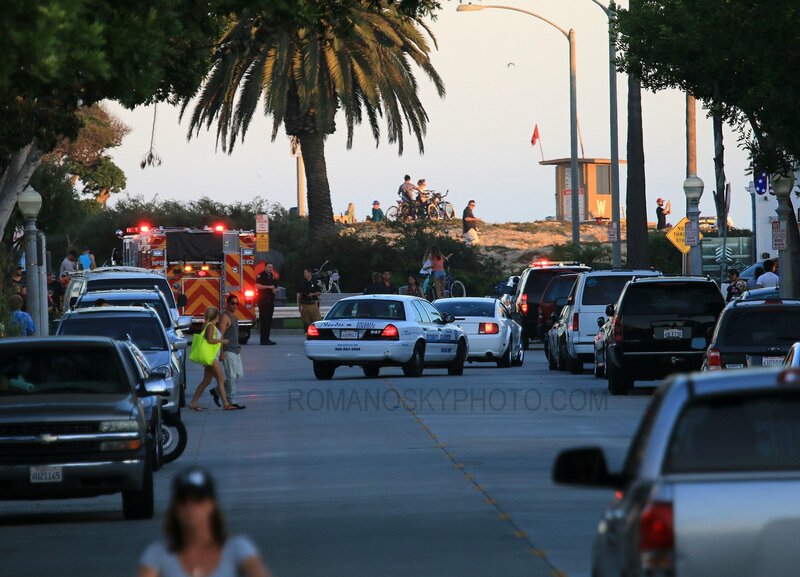 From the street at sunset 7/6/14: a somewhat familiar scene of emergency and police vehicles congregating at Wedge as the red flag on the guard stand is barely affected by a gentle breeze.